The AGITG Innovation Fund is made possible through generous contributions from the Spencer Gibson Foundation, the His Honour Alan Bishop Fund and with donations raised through the GI Cancer Institute’s Gutsy Challenge. Expenditure of these funds requires an overall framework that respects their philanthropic origin, and must align with the strategic direction of the AGITG. Innovation funding will be offered to AGITG members to further AGITG led research. Expenditure decisions will be based on scientific merit and with the intention that they lead to enhancement of the AGITG research program. The successful application will be a proposed AGITG sponsored new research study that aims to lead on to a larger scale AGITG sponsored trial to be supported by a peer-reviewed grant source or industry. This can be a pilot phase, interventional study; a translational or biomarker study; or a project aiming to develop methodology, capacity building or infrastructure. Applications that do not meet these criteria will not be considered. An amount of $200,000 has been identified to support a new AGITG sponsored research study. The amount and duration of funding for individual projects will be determined as part of the application process. Applications will be reviewed and prioritised by the Grants Committee, which will provide a recommendation for funding to the Board. Management of the research funding application process is delegated to the Chief Executive Officer. The award winner will be announced at the AGITG Annual Scientific Meeting – click here to register. Aims to develop AGITG methodology, capacity or infrastructure. Study commencement must be within 6 months of receiving the Grant. Study completion must be within the timeframe. Purchase of the study intervention will not be funded by the AGITG. The successful research proposal will aim to progress the study to a large-scale AGITG-sponsored trial. The research proposal is led by at least one AGITG Member with a minimum of 12 months membership. To view the conditions of funding, please request an application form. You can request an application form by emailing agitg@gicancer.org.au. Click here to view the assessment matrix. Applications close 5:00PM AEST Friday 10 May 2019. 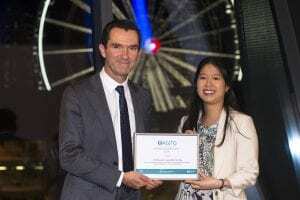 Dr Christina Teng receives the 2018 AGITG Innovation Fund on behalf of Prof Janette Vardy from Chair Prof Tim Price.